Buy 1 for $10.52Buy 2 / Save $0.56!Buy 3 / Save $2.10! With a scent that is spicy, warm, and sweet, cinnamon bark oil is a middle-note that has an odor intensity of a full five out of five. Blending companions include citrus and woods. Its stimulating, warming, digestive, and antispasmodic properties make it useful for many physical ailments. Emotionally, cinnamon oil helps conditions by energizing, increasing feelings of abundance and prosperity, and it is even thought to stimulate psychic awareness. This native of the Near and Far East produces essential oil from the leaves (mild) and inner bark (sweet and hot). Cassia oil (C. cassia) is similar in fragrance. Cinnamon has been a popular flavoring for thousands of years, but has only recently attracted the attention of serious medical researchers. And what these researchers are finding is exciting, especially for diabetics. But, except for those with thrush, there is little hard evidence that there are any benefits to be derived form using cinnamon-containing products. On the other hand, the risk of use appears to be minimal, and there would certainly be no reason not to experiment with cinnamon-containing products. If unexplained mouth pain is experienced, it probably is a consequence of irritation produced by the cinnamon. Cinnamomum verum, Laurus cinnamomum, Ceylon cinnamon, true cinnamon. A tropical evergreen tree reaching up to 60 feet (18 m), with a highly aromatic bark, shiny leaves and clusters of yellow flowers followed by bluish-white berries. It is a native of Sri Lanka, India and Madagascar and is also cultivated in Jamaica and Africa. Steam distillation of the bark chips. An oil is also distilled from the leaves and twigs. Cinnamon bark oil is light amber with a warm, sweet and spicy aroma. Cinnamon leaf oil is a yellowish liquid with a much less refined, hot and spicy aroma. The odour effect of cinnamon (especially cinnamon bark) is warming and stimulating; a reputed aphrodisiac. 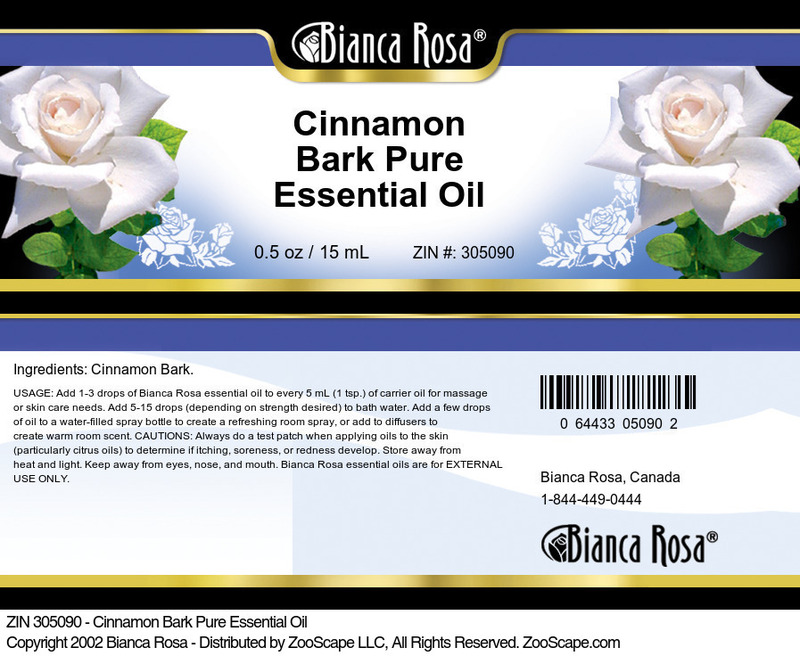 Cinnamon bark oil: cinnamaldehyde, eugenol (4-10 per cent), benzaldehyde, pinene, cineol, phellandrene, furfurol, cymene, linalol. Cinnamon leaf oil: eugenol (80-95 per cent), eugenol acetate, cinnamaldehyde, benzyl benzoate, linalol. Antimicrobial, antiseptic, antispasmodic, antiputrescent, cardiac stimulant, carminative, circulatory stimulant, digestive, emmenagogic, febrifugal, haemostatic, parasiticidal, stomachic, vermifugal. Cinnamon oil (bark or leaf) can be vaporised as an anti- depressant room scent or as a fumigant during infectious illness. Citrus essences, clove, elemi, ginger, frankincense. Both bark and leaf oils are highly odoriferous, so use sparingly. Cinnamon oil (especially cinnamon bark) is highly irritant to skin and mucous membranes. Avoid skin applications of the oil and also steam inhalations. However, the oils may be used in low concentrations in a vaporiser as a room scent or fumigant. Both cinnamon and cassia essential oils are skin irritants. Use sparingly in any blend. my shipment was not only correct but came in a timely manner, that is always a bouns in my book! The oil has a great smell, but i'm not sure it's working to cure the wart on my foot yet. If it does i'll write another review.